This category includes specific parts for the VC01 Computer Pole Carts plus Universal Parts which can also be attached to this cart. 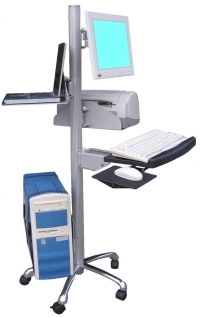 "F MS" Monitor Bracket; "MT" Printer Shelf; "MN" Accessory Shelf; "MKB" Keyboard Tray & "MC" CPU Shelf are "specific" to the VC01 Pole Cart, since they include the dedicated attachment required to slide onto the slotted pole. They can only be attached to this pole cart. These parts will also fit on the VC01, since they have a universal pole-clamp. They can also be used on any pole with diameters from 1.25 - 2.5". Click on any image or link for full information. Please contact us at Ph: (321) 303-9598 with all your questions.